This fully-dramatized performance of H.G. Wells' classic, "The First Men in the Moon", features virtuoso performances by Leonard Nimoy, John de Lancie, William Shatner, and notable Star Trek performers. Written at a time when the idea of traveling to the moon was considered ludicrous,"The First Men in the Moon" is the remarkable story of two daring scientists who attempt to reach the moon... and succeed! But when they land, they discover a civilization unlike anything they could have imagined and face dangers beyond their greatest fears. Copyright 1998 Alien Voices, Inc. In this fully dramatized version of H.G. Wells' classic, The Invisible Man, features Leonard Nimoy, John de Lancie, and cast members from Star Trek feature films and all four TV series take you on an incredible journey. The Invisible Man tells the story of the demented scientist, Griffin, played by John de Lancie, who crumbles under his own diabolical scheme in this chilling nightmare of believable horror. The result is a masterwork -- a dazzling display of unbridled imagination and psychologist insight. Featuring virtuoso performances from the entire cast, riveting sound effects and original music, ALIEN VOICES' productions of THE INVISIBLE MAN is an adventure in sound. In this fully dramatized version of H.G. 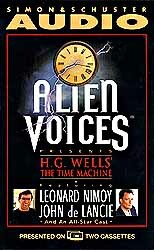 Wells' classic, The Time Machine, Leonard Nimoy, John de Lancie, and cast members from Star Trek® feature films and all four series take you on an incredible journey. When a time traveler seeks a better world 802,000 years into the future, his optimism is shaken when he discovers that the human race has turned upon itself in a primal display of horror. Featuring virtuoso performances from the entire cast,riveting sound effects and original music, Alien Voices' production of The Time Machine is an adventure in sound. In this fully dramatized adaptation of Jules Verne's classic, Journey to the Center of the Earth, Leonard Nimoy and John de Lancie, and cast members from Star Trek® feature films and all four TV series take you on an incredible journey. Journey to the Center of the Earth is the story of Professor Lindenbrock, his nephew Axel and their quest for the secrets contained at the earth's core. Led by Hans, their Icelandic guide, Lindenbrock and Axel descend deeper into the planet than anyone has ever gone before...but will they make it back to the surface alive? Featuring virtuoso performaces from the entire cast, riveting sound effects and original music, Alien Voices' production of Journey to the Center of the Earth is an adventure in sound. In this fully dramatized, live performance of Sir Arthur Conan Doyle's classic, The Lost World, Leonard Nimoy, John de Lancie, and cast members from Star Trek® feature films and all four TV series take you on an incredible journey. 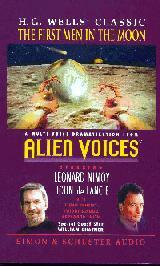 NEWS FLASH: John and Leonard have just finished working on "The First Men in the Moon" for their Alien Voices company. John de Lancie and Leonard Nimoy have just signed a contract with Simon & Schuster Audio to produce their "Spock VS Q Armegeddon Tonight". Alien Voices work has attracted such media groups as the Sci-Fi Channel, National Public Radio (NPR), New Line Television, Samuel French & Co., Dramatic Publishing, Rhino Home Video, and most recently the popular Internet group, Big Entertainment. Be on the look out for new productions soon! 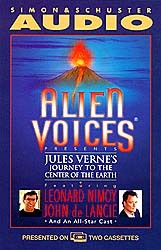 Visit Leonard Nimoy's and John de Lancie's Alien Voices, Inc.
To visit Simon and Schuster's Alien Voices web site click here.